PICmicro MCU Part Number Feature Comparison. Feature to Part Number Table. Device Pinouts. Low-End. Mid-Range. PIC17Cxx. PIC18Cxx. PICmicro MCU Instruction Sets. Parameters. Low-End Instruction Set. Mid-Range Instruction Set. PIC17Cxx Instruction Set. PIC18Cxx Instruction Set. Microchip Special Instruction Mnemonics. Parallax PICmicro MCU Instruction Set. PICmicro MCU Processor Architectures. The PICmicro MCU’s Arithmetic Logic Unit. Low-End PICmicro MCUs. Register access. STATUS register. Program counter. Mid-Range PICmicro MCUs. Register access. STATUS register. Program counter. Interrupt operation. Interrupt handler skeleton. PIC17Cxx. Register access. STATUS register. Program counter. Interrupt operation. Interrupt handler skeleton. PIC18Cxx. Register access. STATUS register. Program counter. Interrupt operation. Interrupt handler skeleton. PICmicro MCU Register Mappings. Low-End PICmicro MCUs. Mid-Range PICmicro MCUs. PIC17Cxx. PIC18Cxx. Built-In Hardware Features. Configuration Registers. Oscillators. Sleep. Option Register. Input/Output Ports and TRIS Registers. Watchdog Timer. TMR0. Prescaler. TMR1. TMR2. Compare/Capture/PWM(CCP) Module. USART Module. SSP Module. SPI operation. I2C operation. Built-In ADC. Built-In Comparators. Parallel Slave Port. Built-In EEPROM Data Memory Access. EPROM Program Memory Access. Flash Program Memory Access. External Parallel Memory. PICmicro MCU Hardware Interfacing. Power. Reset. Digital Logic Interfacing. Parallel Bus Device Interfacing. Button Interfacing. Switch Matrix Keypad/Keyboard Interfacing. Combining Input and Output. Simulated “Open Collector’’/“Open Drain’’ I/O. LEDs. Multisegment LED displays. LCD Interfaces. I2C Bit Banging “Master’’ Interface. RS-232 Interfaces. RS-485/RS-422. Asynchronous Serial I/O Software Routines. Dallas Semiconductor One-Wire Interface. Reading Potentiometer Using Parallel I/O Pins. Motor Drivers. R/C Servo Control. Audio Output. AC Power Control. Hall-Effect Sensors. Sony Infrared TV Remote Control. PICmicro MCU Programming. “Hex’’ File Format. Low-End PICmicro MCU Programming. Mid-Range Serial Programming. PIC17Cxx Programming. PIC17Cxx ICSP Programming. PIC18Cxx Programming. Microchip ICSP Programming Connector. Third Party/Downloadable Programmers. PC Interfaces. Memory Map. I/O Space Map. Interrupt Function by Number. ISA Bus. ISA pinouts. Interrupts. Keyboard and Mouse Ports. Connector specification. Keyboard operation with timing diagrams. Keyboard scan codes. Keyboard controller commands. BIOS interfaces. Keyboard commands. Serial Port. Connector pinouts. 8250 block diagram. Serial port base addresses. 8250 registers. Interrupts. Interrupt 14h–RS-232 communications APIs. Parallel Port. Block diagram/connector. Base registers. Registers. Data output waveform. BIOS interfaces. Useful Code “Snippets’’. Jumping Outside the Current Page. Tables. Conditional Branching. Time Delays. Negating the Contents of a Register. Incrementing/Decrementing “w’’. Rotating a Byte in Place. Copy Bits from One Register to Another. Converting a Nybble to ASCII. Converting an ASCII Byte to a Hex Nybble. Using T0CKI as an Interrupt Source Pin. Dividing by Three. Sixteen-Bit Pulse Measurement with 5-Cycle Delay. Detect a Change in a Register. Test a Byte within a Range. Convert ASCII to Upper Case. Swap the Contents of “w’’ with a Register. Swap the Contents of Two Registers. Compare and Swap if Y_ X. Counting the Number of “1’’s in a Byte. Generating Parity for a Byte. Keeping a Variable within a Range. Swapping Bit Pairs. Bitwise Operations. Constant Multiplication. Constant Division. 16-Bit Numbers. Defining 16 Bit Numbers. Increments and Decrements. Addition/Subtraction. Bitwise Operations on Constants and Variables. Comparisons with 16-Bit Variables. Multiplication. Division. PICmicro MCU Operations Tables. I/O Pin Current Capabilities. RC Oscillator Component Values. LP Oscillator Operating Characteristics. XT Oscillator Operating Characteristics. HS Oscillator Operating Characteristics. PICmicro MCU Application Debugging Checklist. PICmicro MCU Application Software Development Tools. Microsoft Compatible Editor “Ctrl’’ Key Combinations. MPSIM.INI. MPLAB. Stimulus (.STI) files. MPLAB assembler directives. Standard Declaration and Include (“.inc’’) Files. Linking–Linked Applications. Application Code Template. The BASIC Language. Microsoft BASIC Enhancements. PicBasic. Visual Basic. MSComm control. The “C’’ Language. Declarations. Statements. Operators. Directives. “Backslash’’ characters. Common C functions. 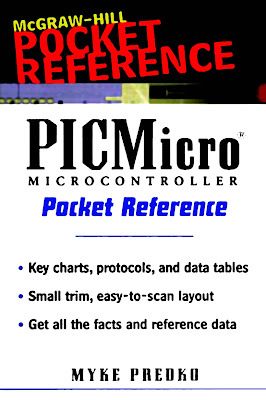 PICmicro MCU enhancement functions. Constants and Data Tables. Mathematical and Physical Constants. ASCII control characters. ANSI display control sequences. IBM PC extended ASCII characters. Windows ASCII characters. EBCDIC. Audio Notes. “Touch-Tone’’ Telephone Frequencies. Modem “AT’’ Commands. Modem registers. Morse Code. Phonetic Alphabets. “Ten’’ Radio Codes. Miscellaneous Electronics. Resistor Color Coding. Electromagnetic Spectrum. Radar bands. Digital Logic. Gates. Flip flops. Formulas. DC Electronics Formulas. AC Electronics Formulas. Mathematical Formulas. Boolean Arithmetic. Conversions. Resources. Microchip. PICmicro MCU Books. Useful Books. PICList Internet List Server. Recommended PICmicro MCU Web Sites. Periodicals. Useful Web Sites. Hardware FAQs. Part Suppliers. Digi-Key. AP Circuits. Wirz Electronics. Tower Hobbies. Jameco. JDR. Newark. Marshall Industries. Mouser Electronics. Mondo-tronics Robotics Store.